Let us help you design and build your new dream home. A home is usually the biggest investment anyone makes. Most of us would not think twice about hiring a Professional Financial Planner to plan our retirement. Use that same good judgment by selecting a Quality Contractor when you plan your next home. Working with each homeowner to build a true and realistic budget, and keeping the budget in line is a high priority. We provide a high level of communication skills, before, during and after the construction of your project. 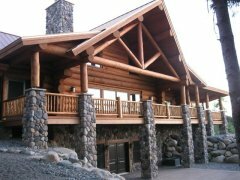 We build year round and can manage the construction of your dream home from designing to finishing. We specialize in custom homes for the residential customer as well as light commercial buildings. From a cabin on the lake, to the home that will impress your business associates and friends, to the new building that will be the home of your business. We help design custom plans that meet every budget, big or small, with floor plans that are highly functional. We will assure you of an exclusive and prestigious design that will fit your budget and meet your every need. Maybe you have a specific style in mind, an original concept or just some ideas that you do not know how to put together yet. You have searched the internet and house plan magazines but have not found your perfect plan or what you have found needs a few changes to meet your specifications. Possibly you have sketched out the rough plans for your dream home. Either way, we can help bring your design vision to life.